This article was originally published on VCStar, and can be found here. 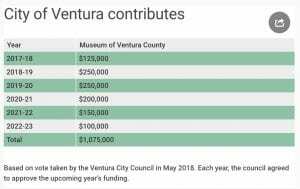 With near agreement that the Museum of Ventura County is successfully revamping after a near closure, Ventura’s elected officials voted to set aside $250,000 for the downtown institution in the city’s 2019-20 budget. The taxpayer-funded contribution will be considered and finalized once the City Council approves the final spending plan, which according to the city’s charter must happen by June 30. It wasn’t a unanimous vote. Council member Jim Friedman said he has been a member of the museum for 30 years and recently donated $1,000 to the institution from money he raised during November’s council race. But he cast the lone “no” vote because the museum wasn’t a core service, he explained. Friedman said he ran on a campaign of prioritizing core services: public safety, roads, infrastructure. Weekly, if not daily, he said, someone asks about a road that needs paving, a sidewalk that needs repairing or some other infrastructure need. What he hadn’t heard until this week, he said, was someone asking about his support for the museum. Friedman said it would be impossible to go back on his campaign promise and then face residents from District 5, the east end neighborhood he represents. “I love the museum … (but) it’s not a core service,” he said. On the other end of the spectrum, council member Cheryl Heitmann preferred to finalize the payment immediately. She said the city gave a commitment for a five-year contract last year. City Manager Alex McIntyre said last year’s direction had been to bring back the funding each year. He credited Brokaw and others for doing a “tremendous job of improving the museum” but also said the $250,000 had to be weighed against other priorities. Council member Christy Weir said it was important to look at the money in the context of the entire budget and noted there could come a time the city needed the money more. The museum, in danger of closing in 2017, reached out to Ventura, the Ventura County government and other places for help. It secured more than $1 million from Ventura, dependent on annual council approval, while the county last year agreed to give $1.7 million over five years. Brokaw highlighted several accomplishments in each of the six pillars that make up the plan: relevant programs, sustainable funding, transparent governance, accessible collections, robust partnerships and compelling vision. Those include collecting items from recent events, such as the Thomas Fire; securing 248 new donors; approving new bylaws; beginning the process toward digitizing parts of its collection; establishing partnerships with community groups; and getting a grant through the Ventura County Community Foundation for a strategic planning process. On Tuesday, the Ventura County Board of Supervisors received an update on how the museum is doing as part of the process for continuing to fund the nonprofit organization. Officials said the second installment of $200,000 in a $1 million funding plan to support ongoing operations will appear in the county budget for the next fiscal year. Another $150,000 will be designated for the expense of consolidating, organizing and processing the collection.